Ferrari let Charles Leclerc down in Bahrain. Sebastian Vettel let Ferrari down. 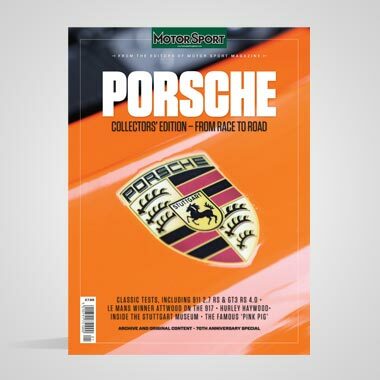 And through it all came a tenacious Lewis Hamilton to steal an unlikely victory with a heady mix of racecraft and desire in a Mercedes that was a long way from Ferrari’s performance. Regardless of the result, this was Leclerc’s weekend. From dominating qualifying to commanding the race, he was apparently on his way to a glorious breakout victory in just his second event for the Scuderia. But ultimately his Ferrari suffered an as-yet-undefined failure of combustion in one cylinder that had run-on effects, which combined to deprive him of a big chunk of the SF90’s prodigious horsepower and made him a sitting duck late in the race to both Mercedes. He was rescued from being further devoured by Max Verstappen’s Red Bull only by the race running under a safety car for the last three laps. 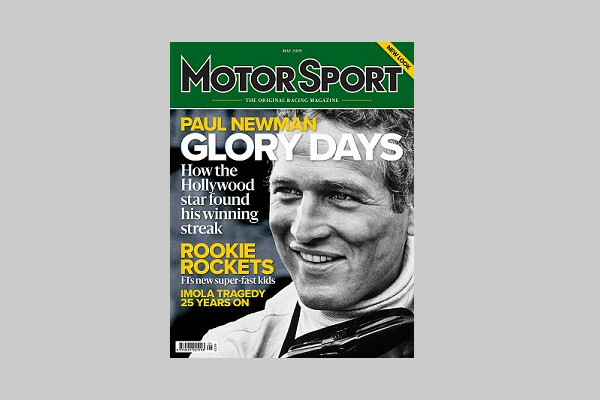 Although there remains a question of mechanical fragility about the Ferrari, there was none at all about its raw performance once freed of the constraints it had been under in Melbourne. Mercedes feels it was extracting all the W10 had to give in Bahrain – and that was just not enough. Every bit of analysis it and Red Bull made suggested that the red cars are enjoying a very significant power advantage. It’s there in the basic grunt of the engine out of the corners and evident too in the longer deployment of the ersK at the end of the straights. Whether there is any connection between this performance and the mechanical fragility is a salient point. The Mercedes has so far been rock-solid reliable and the team delivered a second 1-2 result, but this was absolutely nothing like Melbourne. Mercedes left Bahrain worried about being out-gunned. In which case Leclerc’s transcending of any notional support role within Ferrari may come to be the most crucial point of the season. Just as Ferrari’s performance worried Mercedes to the core, so Leclerc’s must be giving Vettel serious cause for concern. Vettel, by his own admission, underperformed, didn’t get the feeling for the car his more specific driving style relies upon, didn’t feel the necessary rear stability. That and a bit of circumstantial ill-luck left him error-prone, slower than Leclerc and unable to hold off Hamilton, culminating in a spin in the heat of battle and a time-consuming stop for a new nose that saw him finish fifth in a race that should have been winnable once Leclerc suffered his problem. 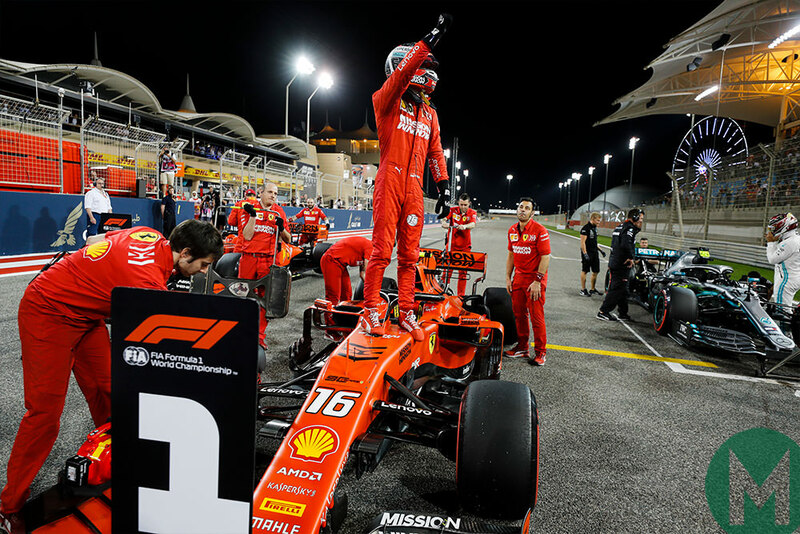 What was perhaps even more impressive than Leclerc’s performance was the way he dealt with the disappointment once out of the car – with a wan smile and a shrug. But perhaps it’s easier to do that when you know there are going to be so many more opportunities. At 21 years old, in his second season of Formula 1, he has a rocket ship to pilot. Bring it on. The extent of Ferrari’s problems in Melbourne was underlined by the car’s spectacular performance here, released from its compromises of two weeks ago. Balanced and powerful, the SF90 was the class of the field from the moment wheels began turning regardless of whether it was scorching afternoon or rapidly cooling evening. Friday practice established that the more powerful engine modes that were not used in Melbourne (other than in qualifying and in/out laps of the race) were safe to be deployed here without imperilling the ers and that normal cooling levels could therefore be used. The nature of the track’s layout and surface didn’t drop the car into an awkward place in its tyre usage and it could therefore load the fronts up without resort to aerodynamic compromise. It was enough to give the Scuderia its 62nd front-row lockout (equalling the record shared also by Williams and McLaren). It was Leclerc who clinched pole by a comfortable margin after team-mate Vettel was left with only one fresh set of soft tyres for Q3, having been released into heavy traffic on his first Q2 run, requiring him to go out again and thereby use up an extra set. 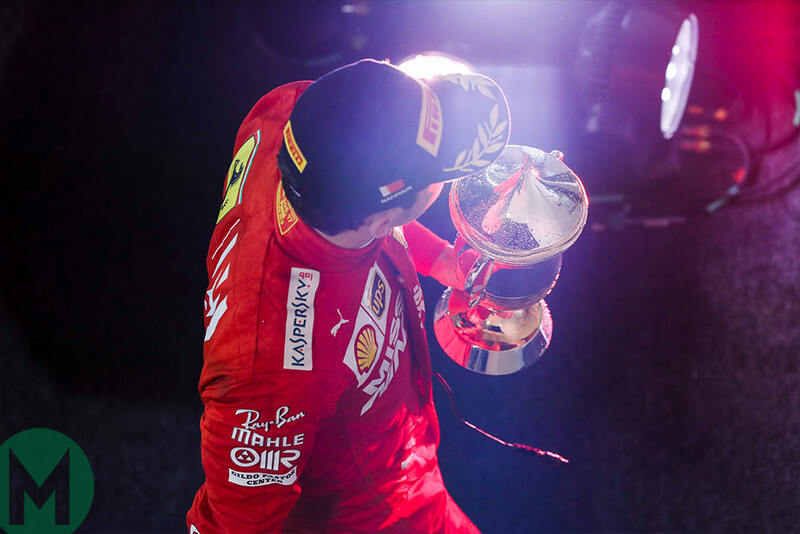 But that was to take nothing away from Leclerc’s achievement. His edge over Vettel had already become apparent in the build-up, both in FP3 and Q1 and he’d definitely found a better way through the first sector. His first Q3 lap would have secured him pole, his second just extended the margin – by just short of 0.3sec over his team-mate and the Mercedes. He was remarkably composed about it all afterwards. “It gives me so many emotions even if I’m trying to stay as cool as possible,” said Leclerc. Mattia Binotto confirmed Saturday evening that his drivers would be free to race. Vettel accepted that he’d had to leave a small margin on his solitary Q3 run without the luxury of a banker lap: “but actually I think, even with an ideal day, it would have been very difficult to beat him today… I’ve been a little bit more vocal about the rear not being exactly where I wanted it to be. The SF90s were fastest past pretty much every trap, whether at the end of the straights or on corner exits. Hamilton was pointing out that they took over two tenths from him in sector one, “which is really just one corner in between two straights,” and that was true. 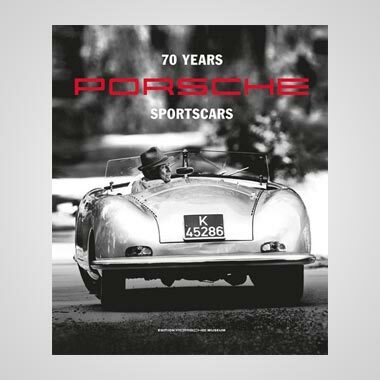 But it was about more than that – the Ferrari was slightly faster everywhere. 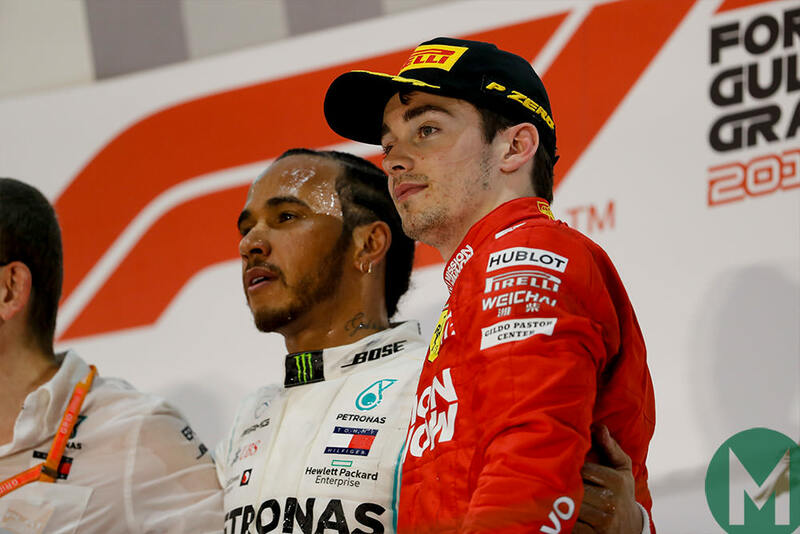 Nonetheless Hamilton and Valtteri Bottas were within hundredths of the compromised Vettel and either could conceivably have knocked him off the front row. “I could see as the lap was going on I was close to Seb’s time, sometimes up, sometimes down and I was right on the edge,” said Hamilton. “It was fun but I couldn’t have done Charles’ time.” Bottas was just 0.066sec slower in fourth. The Merc W10 had taken a lot of massaging throughout the weekend though. The combination of the 2019 aero and narrow-gauge tyres do seem to have made for narrower set up windows for everyone (especially here on a rapidly cooling track into the evening) and Mercedes’ advantage over the ‘Class B’ cars was much smaller than usual through the Friday practices. “We made a lot of changes overnight,” confirmed Hamilton, “and it was in a much better place today, I think.” But he was still only just over half a second clear of Kevin Magnussen’s sixth-fastest Haas, a much smaller margin than usual, thereby just flattering Ferrari’s advantage. The drivers were reporting the car was quite sensitive to the gusty winds and it wasn’t dealing all that well with tailwinds in particular. 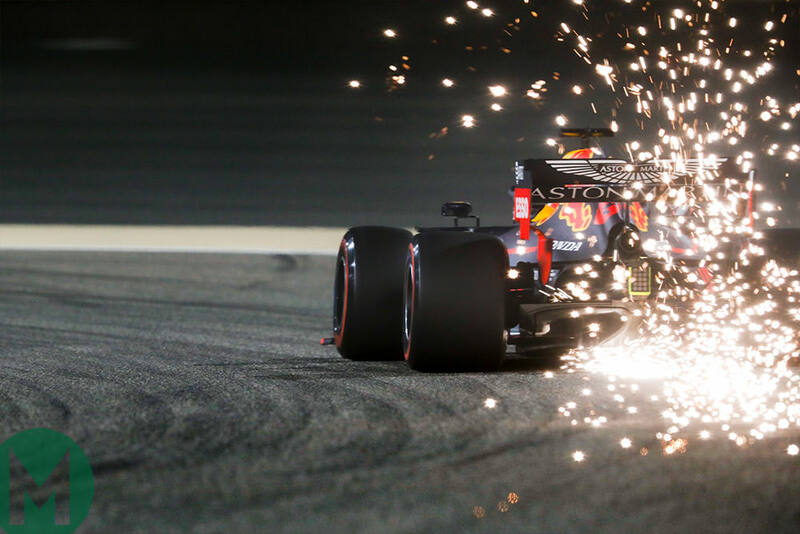 Red Bull fell out of that tyre window completely, both Verstappen and Pierre Gasly struggling all weekend with getting the soft tyres to work, too cold in parts of the lap, too hot in others, the RB15 generally having a wayward rear end under power application, though mini sector times revealed it remained supreme through the long Turn 11. Verstappen absolutely wrung the car’s neck on his single Q3 run (he needed an extra set of softs to make Q3) and only just managed to shade Magnussen for fifth. Gasly felt much more unnerved by the car’s behaviour and never even looked like making Q3, lining up back in 13th place, 0.4s off his team-mate in Q2. 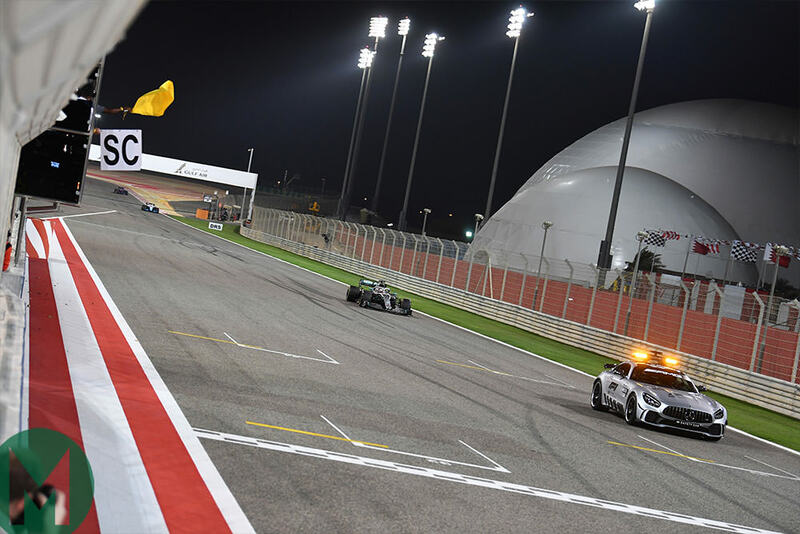 The Haas needed to be massaged into shape, but it was there by Saturday evening and Magnussen was consistently the quickest of the second bunch and on a par with Red Bull. Romain Grosjean was scratching a bit more, suffering a messier weekend in general, broken parts over kerbs etc but his impeding of Lando Norris in Q1 (for which he would receive a three-place grid penalty) was really as a consequence of himself having been compromised by Vettel squeezing past him into the final turn, forcing him to back off to get the required gap for the beginning of his lap. Norris was actually supportive of Grosjean over the incident and critical of Vettel. “He’s got a beautiful future ahead of him"
Grosjean’s Q3 lap was a quarter-second off Magnussen’s, eighth-fastest, and he’d therefore be starting 11th with a penalty. Carlos Sainz’s McLaren split the Haas pair, 0.15sec faster than 10th-fastest team-mate Norris. The McLarens always looked likely Q3 material, with a decent balance from their high downforce settings. They were slow at the end of the straights but pretty fast onto them and the team seemed to have solved the tyre conundrum well. Kimi Räikkönen probably flattered the Alfa in qualifying it ninth ahead of Norris, the car always looking a little lazy and not at its best under braking. Team-mate Antonio Giovinazzi was only 0.1sec slower than Räikkönen in Q1 but that was the difference between getting through and not, so tight was the midfield. He would line up 16th. Both cars had lost valuable practice time to a cooling problem on Friday. 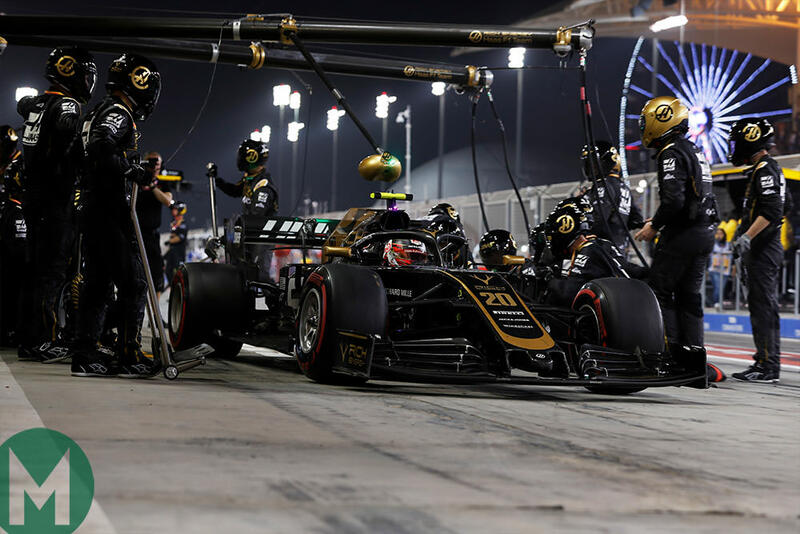 Renault’s Nico Hülkenberg had looked a Q3 cert, vying with the Haas team to be best of the rest – right up until Q1 when a software problem put his engine in safe mode for the critical lap, leaving him a frustrated 17th. Team-mate Daniel Ricciardo made it through to Q2 and qualified 11th there, but he too had his lap compromised by a similar issue. Furthermore, he was not at any point happy with the feel of his new chassis, to replace the one damaged over the Melbourne startline gulley and had trailed Hülkenberg throughout the weekend by a significant margin. Toro Rosso was convinced it could have had both Alex Albon and Daniil Kvyat through to Q3 instead of their respective 12th and 14th slots. Albon ran wide at the last corner of his final lap while an operational error in the garage resulted in Kvyat being sent out for his final run on used tyres. 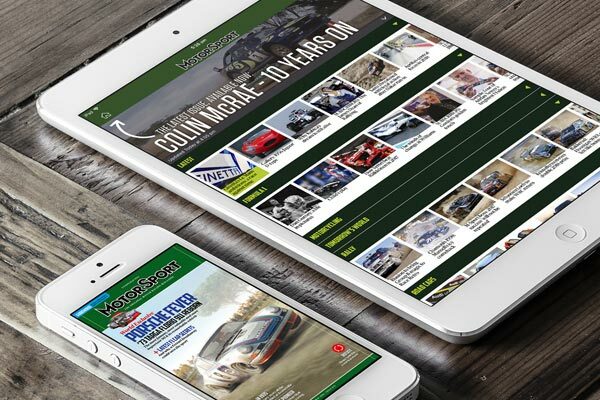 Racing Point is struggling a little at the moment. Sergio Pérez only just scraped the car into Q2 where only Kvyat’s problem got him the 14th-fastest slot. Lance Stroll had been 0.4s slower in Q1 after a messy lap, faster only than the Williams pair. 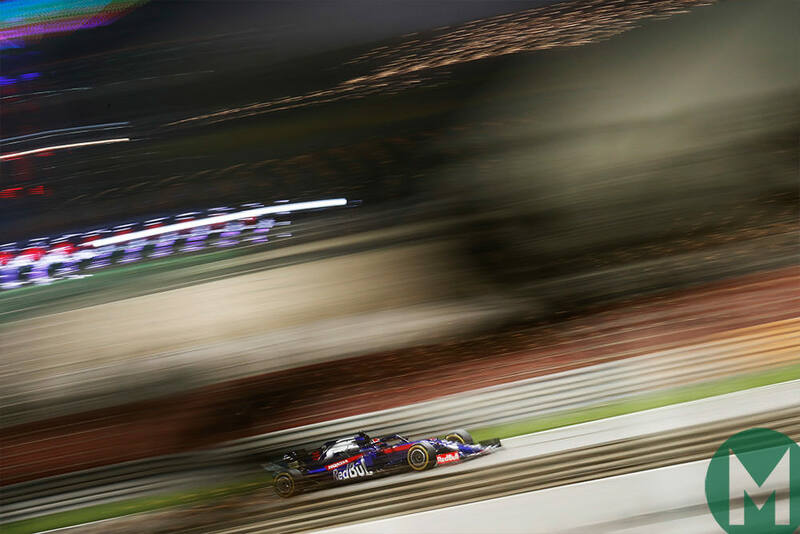 George Russell was just four-hundredths faster than Robert Kubica after a lap he described as ‘really messy’, both drivers having to be very conservative over the kerbs such is the dire lack of spares arising from the late completion of the cars. They were almost 2sec slower than the penultimate slowest car. The strong gusting wind that had hung around all day showed no sign of abating, no respect for the pomp and ceremony of a grand prix start in the floodlit twilight, the kingdom’s many flags blowing wildly. It was a headwind into turn one but would occasionally turn through 90 degrees to be a crosswind there and a headwind into Turn Four. It was strong enough to have a serious impact upon the cars’ behaviour, as drivers were finding out on their laps to the grid. Leclerc led them around a slow formation lap, perhaps a little too slow. He didn’t seem to have optimum tyre grip off the start – beaten into the first turn by Vettel – or in the first few corners, where he came under intense attack from Bottas and Hamilton, silver filling his mirrors as he was forced to swoop hard right early on the straight up to Turn Four, trying to defend as Vettel ran off into an uncontested lead. Hamilton went for the inside as Bottas slipstreamed round Leclerc’s outside. Bottas got to the turn in second place and Hamilton continued to hassle the second Ferrari all the way down the interconnected downhill swoops and trying for the outside of the Ferrari into Turn Eight. There was slight contact as Leclerc stood his ground into the turn and Hamilton was forced to back off, with Verstappen to their inside looking to pounce, but not quite having the space. Only then did Leclerc seem to gather himself up, his tyres now up to temperature. This was a dream start for Vettel, unopposed as the others squabbled. In the mid-pack, Stroll had gone for a gap that was there only briefly and it had understeered him into the side of Grosjean as they squeezed through Turns Two-Three, the Haas being flicked off the track, fatally damaged, the Racing Point trailing sparks on its way to the pits for a new nose. Sainz led the group behind Verstappen from Magnussen but the latter was finding a dire lack of initial tyre grip and was so conservative in the entry to the downhill section it took Norris by surprise, forcing him to take to the run-off to avoid contact, losing him many places. Räikkönen took up the chase of the Haas ahead of Ricciardo, with Pérez and Hülkenberg just behind having made up many places already from their lowly grid slots. Then came Gasly, Albon, Norris, Giovinazzi, Kvyat, Kubica and Russell. Vettel crossed the line many car lengths clear from Bottas and it looked just like the start of a classic Vettel performance, controlling it from the front. Bottas got caught out by the wind as he stood on the brakes for Turn One into the second lap, briefly locked a front wheel as he struggled to get the car turned, this allowing Leclerc down his inside, alongside and past through the right-left switchback. 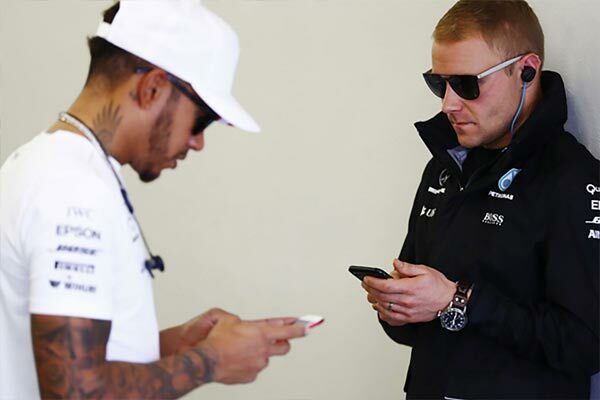 Bottas’ compromised exit made him vulnerable to team-mate Hamilton as they flew down the back straight. There was a new DRS zone there this year, to add to those already in place between Turns 10-11 and down the pit straight. Even though it wasn’t available for another lap yet, Hamilton was slipstreaming the other Mercedes up to Turn Four. Bottas made him go the long way round and got into the turn still ahead but with Hamilton on a better line and with more momentum, their dice continued through the corner’s exit onto the interconnected sweeps, wheels almost touching as Hamilton got alongside – and finally ahead into the downhill right-left of Turns Five-Six. Once free of the Mercedes, Leclerc had devoured the gap to the other Ferrari ahead and by the beginning of the third lap was right with it. Along the straight out of the hairpin of Turn 10, he had DRS on his team-mate, using to pull himself right under Vettel’s rear wing. He got on the radio to say, ‘I’m faster guys,’. Consternation on the Ferrari pitwall already as Vettel simply wasn’t at ease in the car: “I didn’t get the feel for it through the whole weekend,” he explained of the nervy sensation he got from the car’s rear. For now Leclerc followed and awaited further instructions, but he was making it very plain to both Vettel and the team what he wanted. He was not about to sit in support. This wasn’t merely Sebastian controlling the pace to look after the tyres in the early stages either. The thin gauge rubber Pirelli is using for all the races this year can be pushed hard from the off. There is none of the pace management that had crept back into races last year – and for that Pirelli must be applauded. 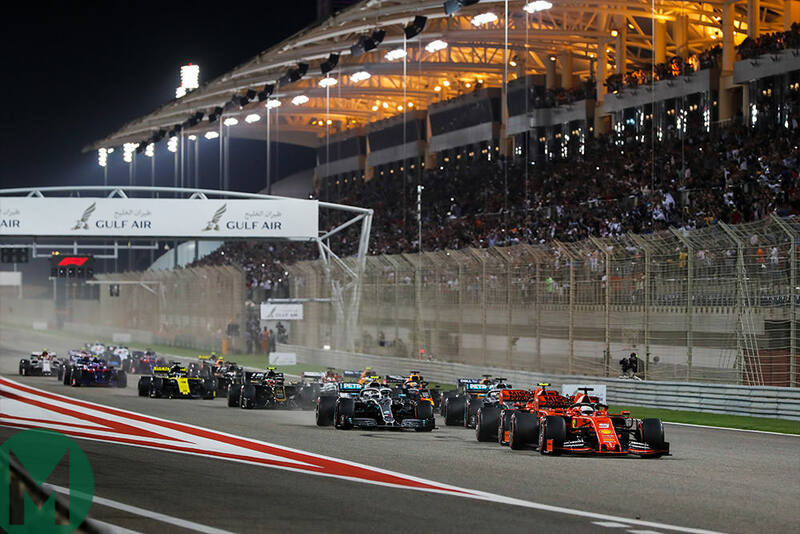 But around the abrasive surface and sustained loads of the Sakhir track, the thinner gauge meant it less feasible than ever that this race could be done on a one-stop (like Vettel had done last year), as there simply wasn’t enough rubber on the tyre. This was set to be one of the season’s few two-stop races - and that’s what pretty much everyone was planning around. The red-striped soft tyre had been chosen by almost everyone for the first stint, with a plan to use the yellow-walled medium for a middle stint. Those with additional new softs available (i.e. the two Mercedes drivers) would ideally be trying to save them for the final stint when they’d be best-suited to the cooling evening track. Just as Vettel was finding the same limitations to his car as he’d had all weekend, so too Verstappen in the fifth-placed Red Bull, falling ever-more distant from the Mercedes ahead and under attack now from Sainz. 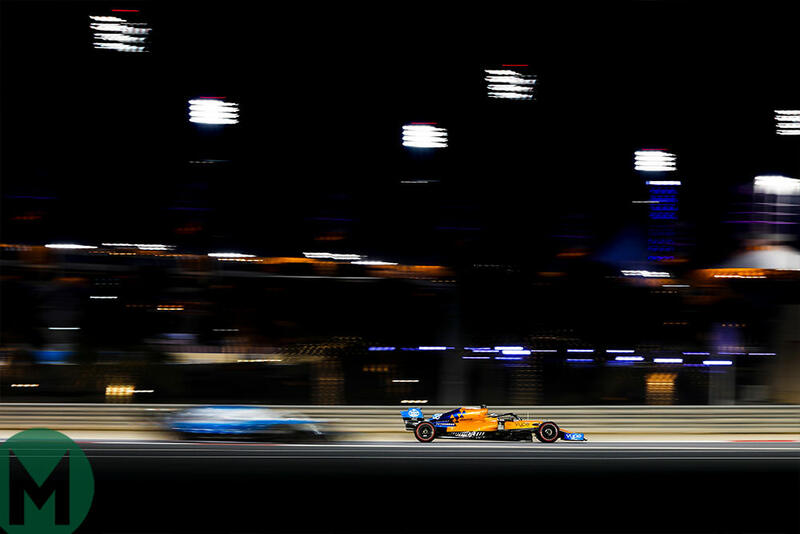 The McLaren driver got a run going through the first two turns to begin the fifth lap and was able to DRS the Red Bull up to Turn Four, Verstappen defending the inside, Sainz with greater momentum turning in slightly ahead from the outside. 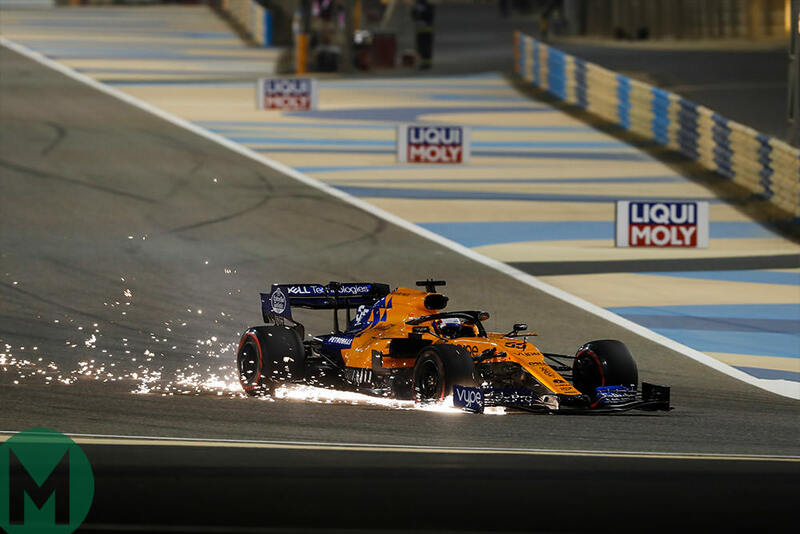 They came to a hefty pinch point in the middle, the Red Bull’s left-front clipping and detaching the McLaren’s front wing, from which sparks cascaded as he headed for the pits, his day effectively done. It had been a brief but very encouraging performance that suggests good progress at McLaren, and it was this that tempered Sainz’s anger afterwards. This promoted Magnussen up to fifth but with a queue behind him as he struggled with the Haas’ poor balance. In this queue, Ricciardo had DRS’d himself past Räikkönen and the pair of them were now all over Magnussen. As Magnussen locked up into the tight hairpin of Turn 10, so he was zapped by those two and Hülkenberg, the latter having already passed Pérez who now applied further pressure to the Haas driver. It seemed odd that a car which had qualified sixth should be struggling to hold off a Racing Point that had been only 14th fastest. Meanwhile up front, Leclerc had tired of waiting for further instructions. At the end of the fifth lap he was hard in the tow of the sister car and with DRS deployed was 30kmh faster through the speed trap. With Vettel covering off the inside, Leclerc simply braked super-late on the outside – and turned in ahead. Vettel counter-attacked up to Turn Four, but unsuccessfully. Thereafter Leclerc just pulled away and by lap 10 had the gap out to over 2.5sec. Vettel was no longer even putting distance on the Mercedes and even though Hamilton was radio-ing that his rear tyres were beginning to wilt by this time, he was catching the Ferrari and with the first pitstop window opening, he was beginning to pose an undercut threat to Vettel. On the 11th lap, Red Bull had picked up a pressure loss in one of Verstappen’s rear tyres – a slow puncture. He was brought in at the end of that lap for his fresh medium tyres. This put undercut pressure on Bottas ahead, with Mercedes responding on the next lap. It wasn’t a particularly quick stop and Verstappen’s out-lap had been a good one. As Bottas exited the pitlane, the Red Bull went past. Bottas was all over it, the Mercedes clearly faster and looking for a way by, which it would find a couple of laps later, around the outside of Turn Four. Leclerc, as the lead Ferrari, was brought in for his stop at the end of lap 13. Mercedes brought Hamilton in on this lap too. That combined meant Vettel was now super-vulnerable to be undercut out of second place – especially as Hamilton had been fitted with another set of softs for the sole purpose of getting track position by a faster out-lap. So it proved, Hamilton sweeping past as Vettel rejoined from his lap 14 stop. As cars steadily peeled off up the pitlane at this point, one of them stayed resolutely out: Ricciardo was trying to rescue his weekend from oblivion by going for a one-stop. If anyone could make it work, it would be Ricciardo, but it seemed wildly optimistic. He’d assumed the lead as Vettel pitted but was quickly devoured by Leclerc, Hamilton and Vettel. Hamilton didn’t like the second set of softs. The hard out-lap he’d made on them to get ahead of Vettel seemed to have compromised them. “That second stint was just horrible,” Hamilton recalled later. Vettel (on his more durable mediums) was soon tracking him back down. Hamilton briefly left the track on the exit of the final turn and he wrestled with the car. By lap 20 Leclerc’s lead over him was almost 7sec. Three laps later and Vettel had DRS on him down the pit straight, Hamilton fending him off into Turn One but easy meat for the Ferrari up the second DRS zone to Turn Four, Vettel going clean around the outside to put Ferrari 1-2 once more. In the midfield, Pérez had found a way by Magnussen who was then hounded by Norris. The latter had recovered well from his first lap adventure and had passed Gasly and the two Toro Rossos (Albon ahead). Gasly had followed Norris through past the Toro Rossos but wasn’t making the headway one might’ve expected of a Red Bull. “I need to somehow adapt my driving style to this car,” said the Frenchman after the race. Kvyat lost time with an off after tangling with Giovinazzi into Turn 11. Racing Point pulled the undercut plug early on this group, and after it had all played out Räikkönen still headed it, but Pérez had vaulted past Hülkenberg, while Norris had passed Magnussen. Albon got back ahead of Gasly at the stops and these two continued to dice hard before Gasly finally got the upper hand. In time Magnussen would drop to the back of this queue and even be passed by Giovinazzi and the delayed Kvyat. Hülkenberg and Norris were the fastest of this ‘Class B’ group and during the middle stint would rise back to its head, passing Räikkönen and Pérez, the latter also being passed by Gasly. 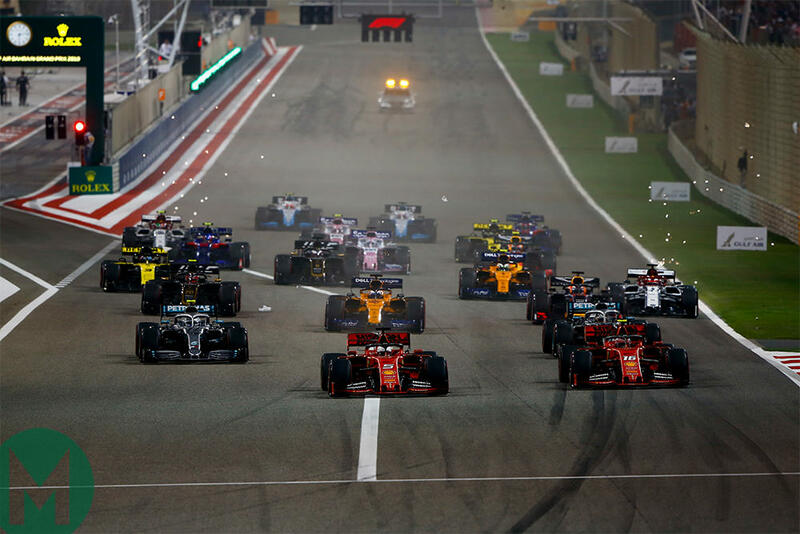 Ricciardo’s one-stop wasn’t really working, as it was simply too slow, and after it had all played out he was vying with Gasly and Albon, well behind two-stopping team-mate Hülkenberg. At the back the Williams drivers were having their own race, Kubica ahead for the first stint, Russell eventually finding a way by in the second and staying ahead to the end. Hamilton was brought in to be rid of his softs at the end of lap 34 and switched to mediums. Ferrari responded with Vettel next lap, with Leclerc and Bottas making their stops in each of the subsequent laps. This changed the gaps in favour of the earlier stoppers (boosting Vettel’s gain on Leclerc, with Hamilton having made time on them both) but the order remained the same. Leclerc edged away all over again, totally in command, setting what would stand as the race’s fastest lap, as Vettel came under renewed attack from Hamilton. 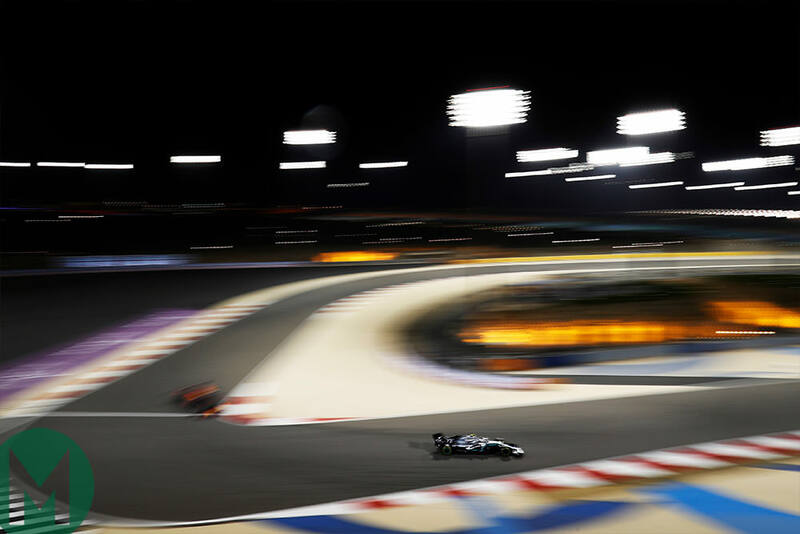 On the 37th lap Hamilton noticed the Bahraini flag at the end of the pit straight was now blowing strongly in a direction that promised a strong headwind – and therefore a big downforce boost – into Turn Four. He staked his next move on this, getting DRS on Vettel up there and taking in hugely more speed around the outside. Vettel was able to just scrape ahead on the exit and down through the sweeps, the pair showing incredible precision and judgement in their dice. Undeterred, Hamilton tried the same move again the next lap and this time got ahead through the turn. Vettel tried to stay hard right on the exit, so as to be placed on the inside for the approach to the downhill sweeps. 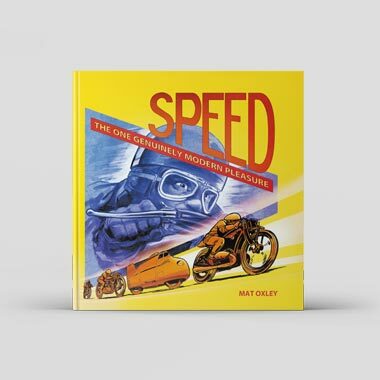 But it was too tight a line to withstand both his full-throttle application and the tailwind – and in an instant, the Ferrari was spinning down the track. As he spun-turned his way back into the fray, he took a rear tyre down to the canvas. He limped pit-wards with severe vibrations from the destroyed tyre and as he travelled between Turns 10 and 11 the oscillation broke off the front wing, which got under the car and briefly sent it airborne. Once at the pits, the mechanics (including Francesco Cigarini, who broke his leg in the pitlane here last year) quickly changed the car’s nose. Vettel rejoined eighth, behind Norris. With Leclerc in such commanding form, it was a bad time for Vettel to be making another race error. He brushed it off afterwards, but the 21-year-old was not only faster than Vettel this weekend, but more composed – and just as the Ferrari is emerging into what may possibly be the form car of the coming races. In a faster car, Vettel should not really have been under pressure from Hamilton and in terms of speed alone, this was an under-par performance; he will surely not habitually be 0.3sec slower than Leclerc. But on the occasion that he was, he desperately needed not to add to his recent tally of race errors. In the remaining laps he quickly picked off Norris and Hülkenberg to get back up to fifth, but Verstappen’s fourth place was a long way out of reach. That, it seemed, was that. Then with 11 laps to go, an anguished radio call from the leader: “There is something wrong with the engine!” It had just dropped a whole load of power. Ferrari was unwilling to divulge details but acknowledged Leclerc was a cylinder down. “We had reduced combustion from one cylinder,” said Mattia Binotto. “But the engine was still able to run and we will certainly be using it on Friday in China.” Leclerc was advised by radio that he no longer had ERS-h recovery but this is thought just to be a consequence of the cylinder problem rather than a failure of the ersH. If, as claimed, there was no mechanical damage to the engine, it suggests perhaps a spark plug or injector failure. All that Leclerc knew at this stage was that he was drastically down on power and with it running like this, it was probably going to burn up all its fuel before the end of the race. He was given instructions into what settings to select in a desperate effort to get it through the remaining laps. Meanwhile the Mercedes were soon upon their limping prey, Hamilton going past on the backstretch before Turn 11 on the 48th lap, Bottas six laps later. Verstappen too looked like he would soon be able to pick him off, but then suddenly the race was minus two Renaults and there was a safety car to clear them from the track with four laps to go. This could either have turned out to be the rescue of Leclerc’s third place if the race finished under the safety car or a disaster that would allow the entire field to pass him if there was a restart. Hülkenberg’s engine had audibly destroyed itself as he reached the end of the pit straight – and he pulled off after what had been a great drive from 17th on the grid to the head of ‘Class B’ in sixth (thus handing that distinction to Norris). Seconds later, the sister car of Ricciardo – running between Räikkönen and Gasly - lost all electrical power at much the same place! The ersK had failed. He too pulled off to the side. Things were complicated for the marshals by the fact that Ricciardo had walked off without re-attaching his car’s steering wheel, because the ers system was still showing as live and he naturally wanted to avoid potential electrocution. Hamilton thus took victory number 74 and Mercedes secured its second 1-2 out of two races. But that was not an accurate picture of performance, as Mercedes was quick to acknowledge. After climbing out of his car, Hamilton made a point of going to commiserate Leclerc. The body language suggested more than just empathy though; it looked like respect. “He’s got a beautiful future ahead of him,” said Hamilton later. Leclerc just stood to the side, dazed but composed.